Home » Free Leonard Peltier » De wereld... » OBAMA...... NOG ONGEVEER 60 DAGEN TE GAAN... HOOGDRINGEND! President Obama’s tijd loopt af en tegelijkertijd ook Leonard Peltier’s tijd! If you, as President, truly seek freedom and justice for all, act to right the wrongs committed by our government in years gone by. 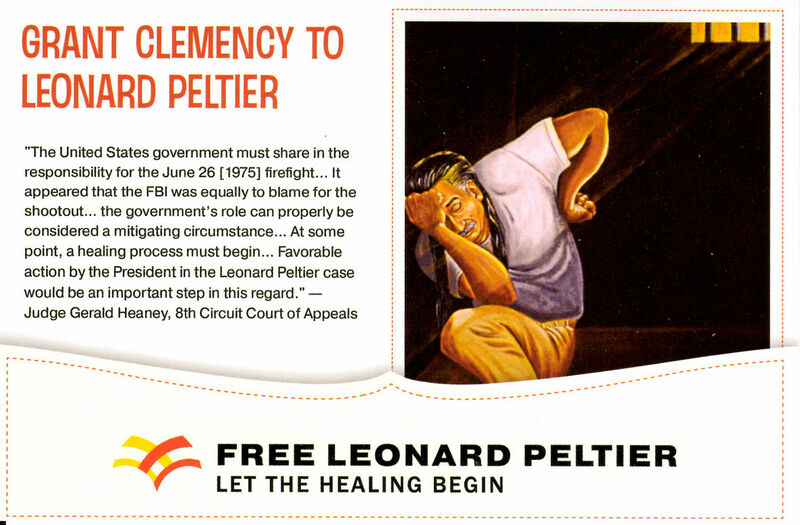 Grant Executive Clemency to Leonard Peltier. Leonard Peltier was wrongfully convicted for the 1975 shooting deaths of two agents of the Federal Bureau of Investigation. U.S. prosecutors have repeatedly admitted that they did not and cannot prove Peltier's guilt and the appellate courts have cited numerous instances of investigative and prosecutorial misconduct in this case. As late as November 2003, the 10th Circuit Court of Appeals acknowledged that "…Much of the government’s behavior at the Pine Ridge Reservation and its prosecution of Leonard Peltier is to be condemned. The government withheld evidence. It intimidated witnesses. These facts are not disputed." The courts claim they lack the power to right this wrong but as President, you can. In this case, I believe your concern should be for equal treatment. From the time of Peltier's conviction until the mid-1990s, according to the Bureau of Justice Statistics, the average length of imprisonment served for homicide in the United States ranged from 94 to 99.8 months. Even if you were to take Peltier's two consecutive life sentences into account at the higher end of this range, it is clear that Peltier should have been released a very long time ago. His continued imprisonment after over 30 years appears to be nothing less than revenge for a crime Leonard Peltier did not commit. Personalized and politically motivated vengeance of this kind cannot be tolerated. The concepts of justice and good government require that you act to correct this wrong. Peltier has served his time. Even by the government's own definition, he has already been imprisoned for a lifetime. In that time, he has missed the simplest things of ordinary life—having dinner with friends, taking walks in the woods, gardening, children's laughter, dogs barking, the feel of rain on his face, the sound of birds singing... winter and summer and spring and fall. He has missed seeing his children and grandchildren grow up. They suffer, too. Leonard Peltier is now a great-grandfather. How many more generations must suffer this tragedy? Leonard Peltier is over 70 years old and his health is deteriorating. He has suffered a stroke which left him partially blind in one eye. For many years, Peltier had a seriously debilitating jaw condition which left him unable to chew properly and caused consistent pain and headaches. Today, Leonard Peltier continues to suffer from diabetes, high blood pressure, and a heart condition. He risks blindness, kidney failure, stroke, and certainly premature death given his diet, living conditions, and health care. I say enough is enough, Mr. President. Do the right thing. Grant Executive Clemency to Leonard Peltier right away. Thank you for giving fair consideration to Leonard Peltier. We need to have at least half of the MEPs' signatures before the Declaration can be sent to President Obama from Europe calling for the release of Leonard Peltier. Ireland For Peltier is urging all our European friends, comrades and supporters to please call your MEPs urging them to sign the Declaration. We need relentless lobbying at the moment to possibly speed up the influx of signatures if we expect to have this to President Obama before he leaves office. Find your MEP here: http://www.europarl.europa.eu/meps/en/map.html.